It is the end of January and like every year I end up with a Christmas Tree Ornament separate from the Christmas stuff. I think it began the Christmas of 2000. My husband’s sister gave us a Christmas Tree ornament for Christmas. It was a Lenox ornament. It is a snow flake made of gold metal and china. The china is on top of the metal. At the time of this posting I don’t have a picture of it because it IS put up with the Christmas stuff and I didn’t know I was going to be posting about my ornaments. I might be able to find a picture eventually. 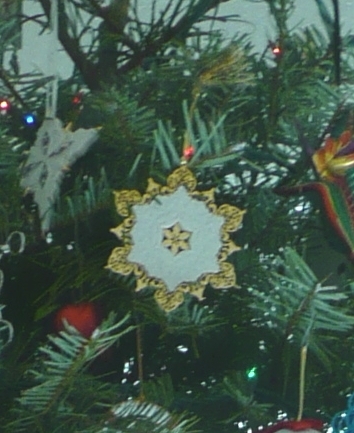 (01.31.11, I found a picture with the first ornament in it. It is not a great shot because it was of the entire tree. I cropped it.) Anyway, this ornament started my love of Lenox ornaments. I went online and discovered they have a lot of Christmas Tree ornaments. They even have a club that you can join and you receive an annual Snow Flake. I always admire my snowflakes. Every time I put them out I grab one and I say, “Oh, this year is my favorite.” Then I pick up another one and say, “No, THIS is my favorite.” Then I pick up the next one . . . and well, you can see where this is going. The annual ornament is delivered after the first of the year and it never fails no matter how late into January that we pack up our Christmas stuff the ornament arrives after all the boxes are up. So I always end up with at least that one waiting around all year to be put with the other Christmas stuff. One year I forgot about it entirely and it didn’t make it on the tree OR even up with the Christmas stuff until the follow year. This year when I received my ornament I opened it with all the excitement one has when receiving a gift and I was disappointed. The shape is nice and the sparkles on it are red and green, which is fine. But the gold painted on the ornaments is haphazard and careless. It states that it has been hand painted. I thought the reason for advertising something was hand painted was to explain the care that went into the product and to astonish people with the beautiful skill, not be an excuse for a job poorly done. I am saddened. Here I normally love the quality that comes from Lenox and this is very sub par. I am disappointed. I have been buying the annual ornament for ten years, I will give them next year. If the same poor quality comes out then I will cancel. My hubby said there was also no point in contacting the company to explain my dis-satisfaction. I am not entirely convinced that is true, but he caused me to think it would be a waste of time. So, I am just sharing it here. As I often do. Do you have a club that you belong to where you receive a product? Have you belonged to a club where you have seen the quality of the product decline? It is a bummer. This entry was posted on January 29, 2011 at 8:21 pm	and is filed under Misc. Tagged: Christmas Tree, Christmas Tree Ornament, declining quailty, Lenox, Lenox Christmas Tree Ornaments, Lenox ornaments. You can follow any responses to this entry through the RSS 2.0 feed. You can leave a response, or trackback from your own site. I think you should tell them about it. No process is flawless and maybe someone had a bad day and someone forgot to inspect….and boom, you get an ornament not up to THEIR standard. Absolutely you should call them. As a local customer for 10 years, and if they are a reputable company, they will send you another one pronto and you’ll probably be able to keep the one of you have anyway as it will be at their shipping cost for you to send it back. Don’t be a wimp (not that you are or ever would be). Stand up for what you expect as a standard. If they blow you off or tell you that “hand painted” isn’t always skillfully done, then cancel your program. That’s what I would do…and I am a warrior goddess. I used to sit by and not saying anything. I’ve received too many unsatisfactory pieces of merchandise that were less quality than I expected or that they touted. I don’t sit by anymore. Ok. I think I shall let them know. I KNOW that I will meet you one day, but I am not sure about John. I figure that we will meet at a Nia event eventually, but John on the other hand . . . . I don’t know. We can hope and set the intent . . . .